ATTENTION EQUESTRIAN / AUTO ENTHUSIASTS / PROSPECTIVE HOME BUILDERS! This is a rare property! 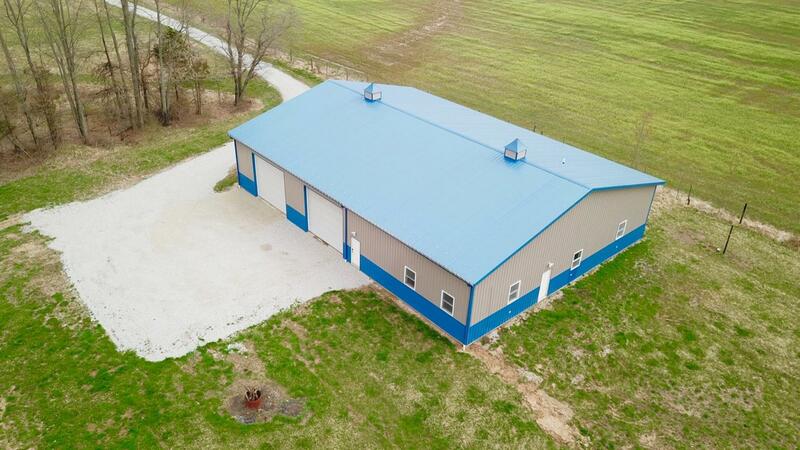 Very nice 60'x80'x14'H pole building, w/ nicely finished living area on 20 ACRES of LAND. Finished living area offers 2 Bedrooms and 1 full bathroom. Nice tile floors, brand new carpet in bedrooms, nice kitchen area with stainless steel appliances included in sale, laundry area, storage loft above living area. The septic system believed to be sized for a new construction home to be built! Whole building is capable of being heated by energy efficient in-floor radiant heating. Brand new Lift Master garage door openers. Nice pond building sites. FANTASTIC LOCATION LESS THAN 1 MILE TO VERSAILLES STATE PARK PROPERTY and PARK TRAILS! This is the 2nd largest State Park in Indiana: 5,998 acres with a 230 acre lake, creeks, pool, camping, walking / hiking / mountain biking trails, and 20+ miles of horse trails! $3,000 allowance offered for heating & air upgrades. Fantastic property and GREAT LOCATION!